It’s National Eating Disorders Awareness week (NEDAW)! As the new clinical director of the UNC Center of Excellence for Eating Disorders (CEED), I wanted to introduce myself. I have been with CEED since 2008 as both a therapist and researcher. As clinical and child psychologist, I specialize in using Family-Based Treatment to help children and adolescents work towards recovery. Often, we focus on preventing eating disorders during NEDAW. Or we focus on breaking down myths about these lethal diseases. However, unfortunately the challenges people go through in trying to find treatment get ignored. So, over this week, I’ll be posting each day on the clinical work that we do at the CEED. At CEED, we know that figuring out treatment can be incredibly confusing. The road map towards care is not always a straight line from point A to point B. Parents and patients often come to us full of questions. “Is it really an eating disorder?” “What type of treatment should I be looking for?” “How can I find a therapist or doctor who can help?” “What should I do if he (or she) doesn’t want treatment?” We want to help you understand both what we offer and how to find treatment in your community. The purpose for this series of posts is to introduce you to members of our team, break down the different levels of care, and give you a road map for seeking care at CEED. This is Laurie Gardner. She has been working with us as our intake coordinator since 2012. Most of the time, Laurie is the first person you’ll talk to in our clinical program. I can’t think of anyone better to represent us. I think you’ll all agree that the first words that you’ll think in talking to her are kindness and compassion. 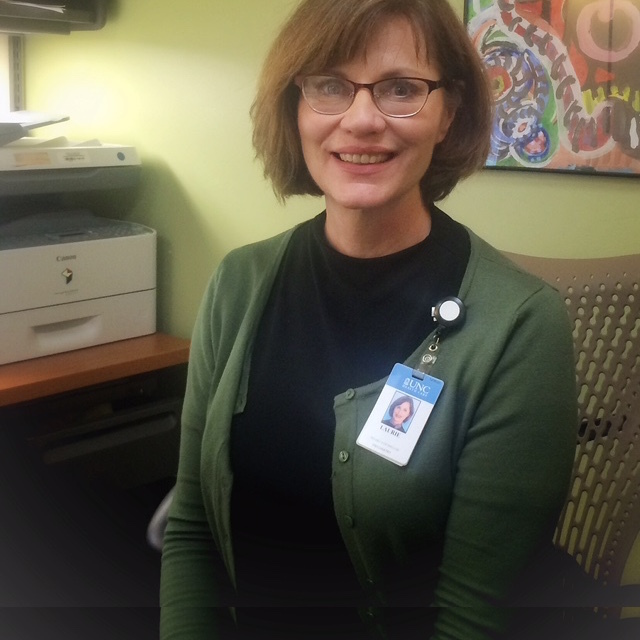 Laurie is passionate about helping patients and families find the appropriate level of care. But in order to figure that out, she (and we) need a lot of information. The first step is to have someone complete our referral form and fax it to us. It’s best if you can have your primary care doctor or pediatrician fill out the form. But it’s absolutely fine if you want to fill out that paperwork yourself. It’s very long but ultimately, it saves you time. I know that many of you might be wondering why we ask for a fax! In this day of quick and easy texting and email, it might have been a long time since you faxed someone. In short, we value your privacy and your trust in us. It’s critically important that your eating disorder status and medical information is kept private. Too often, we all hear about hacks on websites. Until we can provide a foolproof way to collect personal information with no risk of being hacked, we’ll just stick with the tried and true. The fax. But it’s critically important that we can talk to your current doctors and therapists as well. So we encourage you to sign a release so that we can find out more about your or your loved one’s current health status and what led you to seek an evaluation with our team. We want to get as much information from the providers you trust, even before you come in for your first evaluation. Tomorrow, we’ll look at Step 2. The Evaluation. What can you expect when you come in? Who will you be meeting with? What should you bring? And goodness, where do I park?! ?